EVS completely won me over again. This new design is near perfect. I don't even care if he's wearing a classic badge in the center of his chest. Opinions? I'm gonna micro this when it isn't almost 5 am. as i said in the other thread "someone wake me up when they get a clue and Make Kyle Great Again"
They changed his costume again? Is there a full image of his new suit from head to toe? ^I doubt it's meant to last. It's just because Hal overpowered him to send him home. Yeah the image would've just been too large. The last page is basically a splash of this new suit with John and Guy I think on the bottom portion of the pic with the credits. Basically it looks like you'd expect it to. The green in the torso ends at the waste in a point similar to his classic suit, and the boots are just the Corps standard green boots like Hal's. This comic REALLY makes me want Hal/Kyle in a 2814 title. Specifically this version of Kyle. It's still him as a GL just a little more powerful. They could spin this a few different ways without making Kyle Ion-lite. Kyle was always meant to have a special ring. 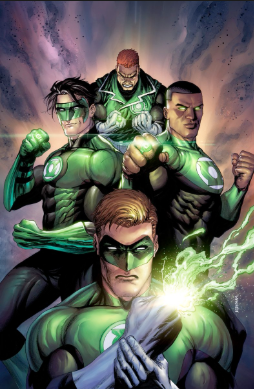 He could continue to use this one as a more standard GL, and despite IonFan's protest I'm sure 90% of Kyle's fans would still be game for this. 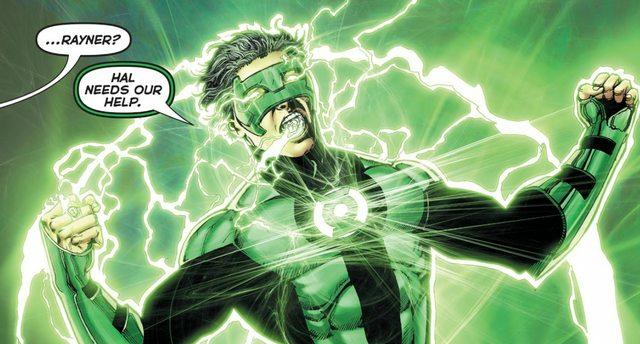 I know the next issue is titled "Hal for a Day" but I could see this being something to better connect the two most popular GL's. It always turned me off when Hal came back and aside from a few pages here and there he and Kyle NEVER shared an adventure. John became Hal's new sector partner, Guy showed up to help Hal with the Lost Lanterns, etc. Only thing Kyle ever did with Hal was tag team Sinestro at the end of the Sinestro Corps War. And there was that one issue where Hal helped Kyle with Alex Nero in the Ion maxi series.... the two most popular GL's should've been in a few more adventures together than that. That's like handicapping the Batman titles by insisting Batman and Nightwing not partner up but once or twice every couple years. There's just no sense in it. I really like it. I hope it stays for a few issues at least. Actually, given that the bits over his nose would have to be paper thin to fit without flattening it, but the other parts are obviously thicker, it is perfectly reasonable to look at the design shown there and assume it flattens his nose. Yeah Banks posted that on his twitter a while back. Jesus Christ...they change Kyle's costume so much it makes my head spin! Hank Pym and Janet Van Dyne aint got crap on Kyle! It only lasted like an issue and another few pages. That's just a variant cover sadly. I dig his Hal Suit. Wait, what costume is Kyle using now then? It's still him as a GL just a little more powerful. So his power is infinite, just a little bigger. I'm assuming back to the original Banks one.